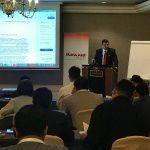 Jordan Knauff & Company (JKC), a Chicago, Illinois-based middle-market investment bank, is pleased to announce that Mr. William R. Snow, Managing Director, recently presented a two-day class in Dubai and Kuala Lumpur entitled “Maximizing Value through Mergers & Acquisitions” sponsored by the Kexxel Group. Executives traveled from Malaysia, Thailand, Japan, The United Arab Emirates, Jordan and Egypt to attend the two classes. The objective of the class was to present an in depth understanding of the process of buying or selling companies through practical tools and real-life examples. The first day of the class explained the basic terms used in mergers and acquisitions, the process timeline/steps, valuation and the strategic imperative, and a review of the documents and legal considerations involved in the process. Day two covered how to make proper overtures to buyers and sellers, financing options, negotiating strategies, what goes on in due diligence, and how to handle post-closing integration. Mr. Snow’s advice was well received by the Jordanians who appreciated the guidance and insight. This highlights the key takeaway for the two classes. Mergers and acquisitions transactions are much more than spreadsheets and data analysis. Successfully executing transactions involves negotiating, explaining, and understanding the other side’s point of view. These principles are exemplified by JKC’s professionals throughout their work in the mergers and acquisitions process. Mr. William R. Snow has over 16 years of investment banking experience (where he has advised middle-market business owners and executives on sell-side and buy-side transactions in a variety of industries) and 14 years of executive and operations experience in middle-market companies. JKC’s entire professional team have spent their careers in the middle-market and offer that expertise and knowledge to their clients. It is their mission to provide the best transaction advisory support services along with in-depth industry research to middle-market companies and the entrepreneurs that lead them. To learn more about Jordan Knauff & Company, please visit www.jordanknauff.com or contact Mr. Snow at wsnow@jordanknauff.com or 312-254-5904. Jordan Knauff & Company is a member of FINRA. Based in Kuala Lumpur, KL, Kexxel Group is a leading business intelligence company providing top level business learning and strategic networking platforms to Fortune 1000 and blue chip companies in Asia, Africa, and the Middle East. Through international business conferences, corporate training, in house training, and international exhibitions, they strive to provide clients with strategic insights that are imperative for them to not only sustain a competitive advantage, but also to emerge as successful global leaders in the corporate world.